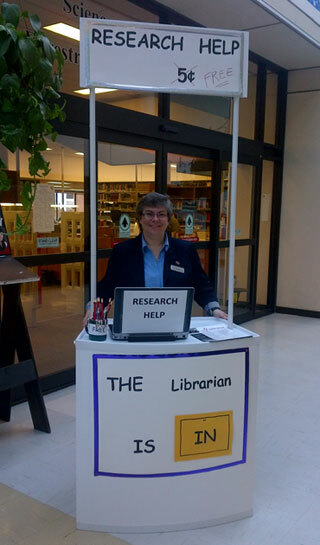 Inspired by Lucy’s booth on Charlie Brown, Judy MacLean decided to set up a 'Librarian is in' kiosk at UNB Fredericton's Science and Forestry Library. "The end of term is a very stressful time for students," said MacLean, who has worked as a librarian at UNB off and on for 20 years. "I wanted to add a little levity at the Science and Forestry library by stepping out of the library and into the IUC concourse for a few hours each morning. I have had the opportunity to speak to many students, faculty and staff that might not have come into my office to seek me out." Many students and faculty don’t realize that libraries have incredible resources that would make their academic lives so much easier, says MacLean. "Many students are intimidated or uneasy about using libraries so they don’t bother coming in. My booth is catching their attention - even if it is just to smile as they walk by. If a student can connect the words 'library' and 'fun' in the same thought bubble, then I will have succeeded." MacLean and the other staff in the Science Library know that little gestures can go a long way. Besides the 'Librarian is in' kiosk, they have set up their annual stress busting colouring station where students can take a moment to unwind by colouring Christmas stockings to add to the library’s decorations, or they can work on crossword or Sudoku puzzles. The kiosk was made possible by support from UNB Libraries, the office of the Vice-President Fredericton (Academic) and Student Affairs and Services. Any faculty member or student is welcome to visit Judy at her kiosk over the next couple weeks. Anyone who stops by to chat will get a free pen or pencil. "I'm really pleased with the response to this outreach initiative, so I’ll be back in the IUC Concourse with my booth in January for the first few weeks of class. If I'm not in my booth, I'll be in the library and I hope that students and faculty will continue to stop by to say hello."